23-Dec-2003 -- The confluence point lies about 10 km south of Mbinga, a few kilometres from the main road linking Mbinga and Mbamba Bay, a village on Lake Malawi. The bishop of the Benedictine Order lives in Mbinga, hence the town is more affluent than many of the others in Tanzania. There is a massive cathedral in Mbinga, almost rivalling the mission complex at Peramiho. From the main road we took a bearing to estimate the location of the Confluence, and then managed to find a small dirt track which wove its way along the cultivated hills in the general direction of the spot. There were many small tracks around the fields, though we didn't see any other vehicles. Eventually, we stopped at a point about 2 km from the Confluence, and I decided to walk the rest of the way because it was unclear whether or not there was a track going all the way to the desired location. I saw only three people working in one field; they returned my greeting in a friendly manner, but must have been perplexed to see an Msungu (local term for a Caucasian) walking about in the hills. 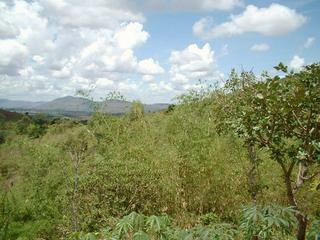 The Confluence lies on the edge of a cassava field, on the side of a hill. When looking north one can see parts of Mbinga. It was pleasantly cooler at an altitude of almost 1500 m above sea level, and thick rain clouds were building up from the west, coming off Lake Malawi. From the confluence point it was easy to find a track all the way back to the car. If we had known where the track was, we could have driven to within about two metres of the point. Talk about 20/20 hindsight! Still, the walk was pleasant, and allowed me to enjoy the views at a slower pace.